Finding the Right HCG Injection Dose. When you are new to the hCG diet, and HCG Injections, it can be pretty overwhelming. Phrases like “syringe” “iu’s” and “bac water” can really throw us off and make the HCG diet feel intimidating. But it doesn’t have to be that way. I guarantee if you take the time to continue to research and read up on the diet, things will start to click. To help you in that way, I thought I’d demonstrate how I go about getting the correction hCG injection dose. On to the lesson folks! The “syringe” part of the injection is the barrel that will contain whatever you’re going to inject and it has little numbers and hash marks to indicate how much it holds. The numbers on the syringe are referred to use “units” and 100 units = 1cc or 1 ml. The most common syringe sizes I see come with the hormone diet kits are 30 unit syringes(.3 cc/ml), 50 units syringes (.5cc/ml) and 100 unit syringes (or 1cc/ml). Please note – some who are purchasing their injection kits from overseas are receiving different syringes that have 40 units per 1cc/ml syringe (instead of 100 units per 1 cc) and my following instructions will NOT apply for these syringes – see the bottom of this post- LESSON 4- for the proper dosing with these syringes. Whatever size syringe you get, you can use this video to figure out how to draw up the proper dose of the hormone. Either you’ll see numbers that say 5,10,15,20,25 etc. Or you may see numbers that say .1,.15,.20,.25 (with a decimal). These numbers are technically the same. .15 is the same as 15 units. .20=20, etc. 125iu dose = 12.5 units (or .125) – sometimes the barrel is labeled slightly differently. Sometimes there may not necessarily be a hashmark with the actual number labeled on it- it may be one of the inbetween hashmarks- but I think you get the picture. 125iu dose = 25 units (or .25) – sometimes the barrel is labeled slightly differently. When you pull your hCG mixture out into the syringe, the easiest way I feel to do it is to hold your bottle of hCG upside down to draw the mixture out. As you pull out the hormone, make sure you don’t have any huge obvious air bubbles. If you do, simply eject the hormone back into the vial and try again (without pulling the needle out and into the vial again- that will dull it too much and make your injection hurt). Don’t let the mechanics of the protocol prevent you from losing weight and experiencing a weight loss journey similar to mine. For the moment I’m going to just past my email to the gal who wrote me saying she ran out of her hCG in 11 days when it supposed to last her a month from her overseas source- we discovered they are now sending some people different syringes – the following should help you find the dosage you desire with these odd syringes. .3 ml/cc syringe will contain 30 units total. See how that is and how it matches up? What this means is that you cannot use the general instructions that you find on the web for dosing (including my website) or you end up taking a much higher dosage of hCG than you thought, and your vial would run out much faster than usual. Now again, this math is based on the knowledge that the hCG was mixed in a ratio of 5000ius to 5mls bac water to begin with okay? So 1 ml/cc = 40 units in this case. So if you filled one of your syringes all the way up, it would contain 1000ius in that 40 unit syringe. 125 ius then we would divide 125 (dosage desired) by 25 ius per unit = 5 units should be taken. My HCG is in 2000 IU’s. I see very little help for those measurements. If I mix 1:1 ratio or 2 ml. what would a correct dosage be? 150iu dose = 15 units and so on. Sorry still so confused after reading. I currently take .05 ml a day what does that amount to? It seems too low according to what you are saying. Working with a Weightloss clinic using hcg. Okay so my apologies watched the video and I take 50 ius does that seem low that’s much lower than the doses you’re saying. with how many ml of solution did you mix your hCG with? I have 2 syringes 50 unit and 100 unit. please tell me if I am looking to take 12.5 units what is the correct amount to use on each of the syringes, please. Hello!! I had been using luer lock syringe but the numbers wore off. I went to the local pharmacy so I wouldn’t have to take a break, and they only had 3ml luer lock. Where would I find 150iu on a 3ml syringe?!? Hi, I’m still confused and I need your help. I bought these BD U-40 weird syringe to inject myself with Somatropin HGH. I should take 3 to 4 IU per day. So how this would work on the U-40 syringe? Thank you upfront for the help. I apologize I’m not sure about this- I haven’t heard of taking only 3 to 4iu a day and I don’t know how you mixed it which would be needed to try to calculate. So what’s the average daily doze for bodybuilding/ beginner, and how to measure it on a u-40 insulin syringe( syringe marked up to 40 only) compared to a u-50 insulin syringe. Hey Alex- I’m sorry I don’t know this information. 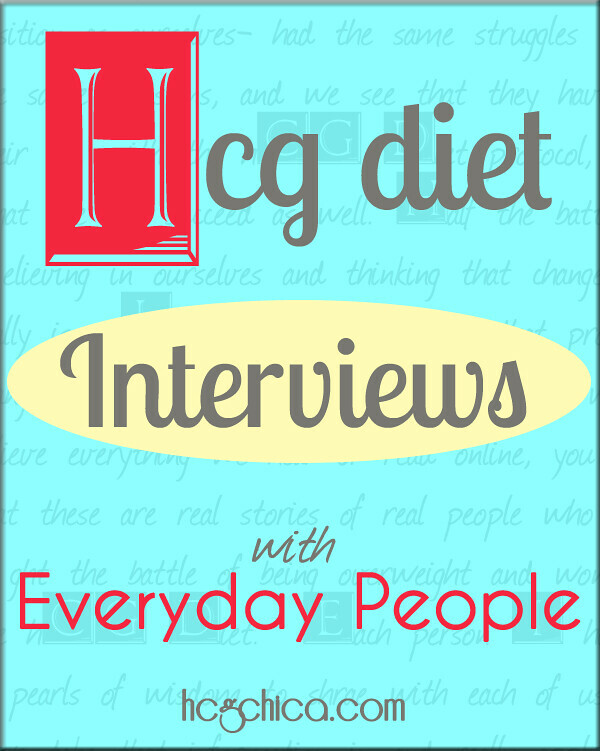 I am only familiar with hCG use for women dieters basically. Your info is great but I’m still a little confused! I have the 5000 iu product and a .5 ml syringe. Am I using half a syringe or two full syringes? The .5 ml syringe contain 50 units in total. Please refer to Lesson 2 of the post. Now depending on what mixing ratio you used, if you used 1:1, please look at the part that says dosages and where to draw up on the syringe. If you are starting with the lowest dosage which is 125iu, then you should draw it up to 12.5 units in the syringe or .125 if your syringe is labeled like that. If you used the 2:1 ratio, the dosage is there, too, just slightly different. 125iu on the syringe is 25 units. Hope that makes sense. That’s really little bac water. 5000iu hCG is usually mixed with 5ml or 10ml bac water as Rayzel instructed on her mixing tutorial videos. I think to get 250iu, you’ll have to inject 5units on the 100unit insulin needle and 125iu will be 2.5 units. I’m super confused because my HcG came already mixed – I picked it up locally at a compounding pharmacy. It’s HcG fortified (B12A-500MCG/ML) 1000 units/ml. I received a 5 ml vial. Instructions say “inject 125 units daily (12.5 on the syringe)” but I was given the UltiCare Insulin Syringes (31 Gauge, 3/10cc, 5/16″ Needle). Their dosing instructions don’t add up? Help! Hey Lorie! Yes so on your syringe, you will see hashmarks correct? The syringe goes up to 30 units (3/10ths of cc where 10/10ths would be 100 units or 1 cc) – so you will be injecting not quite half of the syringe- you will find the hashmark that would equate to 12.5 units of the 30 units- there should be at least a 10 unit and a 15 unit mark on the syringe I should think so halfway between those. One vial usually lasts 3-4 weeks- this depends on what dosage ends up feeling the best to you, but usually at least 3 weeks. The vials all come in 5,000 iu these days and when you buy a longer kit from the online sources, they send you two 5,000 iu vials so you can mix a fresh potent batch halfway through the round. The ordering places are listed here for you: hcgchica.com/buyhcg I hope that helps! Just received my vial of mixed HCG. My gal says it is a 10,000 units in the vial. She instructed me to withdraw 3 units daily for injection into the 100 unit insulin syringe. Is this enough dosage daily? Firstly, you are a lifesaver to anyone doing the HCG program and I thank my lucky stars that you have put so much love and energy to help everyone else by sharing all this knowledge. Is there a reason and/or benefit to mixing 5ml vs 10ml, of water with the 5000iu of hcg? Hi! I just got my HCG in the mail lastnight and I will be mixing on Thursday and start Day 1 on Friday! First question: If I want to start injecting 125IU daily for the next month how much Bac Water should I add to my HCG Vial of 5000IU? some say 4ml some say 5ml. Does it make a big difference how much solvent I add? Second question: When I start my period, should I stop on the heavy days and go back on the light days? Is that going to cause any interruptions in the HCG Diet? Yes, others prefer to mix with 5ml or 10ml. It matters so you know how much you’re injecting. Rayzel, I am so confused! I am just about to start my program and got my pre-made pre-measured syringes. This plan does not allow patients to draw their own and I had to wait until the pharmacy did the processing as the doctors office don’t do it either. Anyway, the amount of HCG looks like a lot, as I have done the protocol before (in another state) and I’m pretty sure my syringe has about twice the amount. I have the 1 cc/ml 100 unit syringe in increments from 10, 20, 30 and so on near the needle top down to 100 at the bottom. 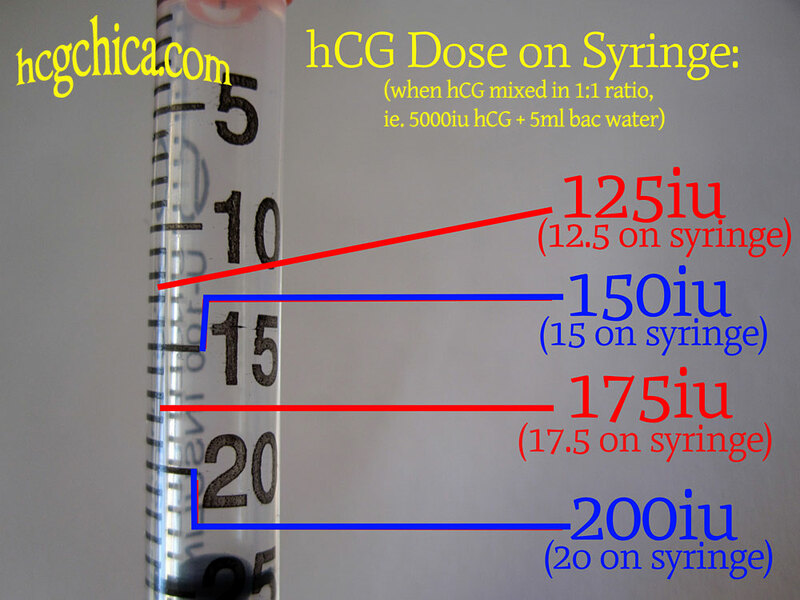 Each syringe is filled to 50 mark (in the middle of the syringe) with the HCG. My prescription says inject 0.5 sub-cutaneous 5 days a week (skip 2 days). I will be starting it tomorrow and I’m more than concerned they are giving me a very high dose but admittedly I’m not sure how to interpret it. Also, the needle while thin is longer than many I’ve seen used with HCG. On the side it says “Easy Touch insulin u-100”. Based on what I’ve said, can you help me figure out how much I’m actually getting? Since it’s already pre-measured and I’m on a 21 day protocol, should I inject only part of what’s in the syringe if I’m feeling hungry or not losing? I know you aren’t a medical professional but your impression would be helpful. Thankyou. This is Lucelle, Rayzel’s helper. We really can’t tell what dose that is because we don’t know how it is mixed. You can try asking the company how much iu there is for each syringe. I used HCG from a Dr. prior to ordering from an online pharmacy. It seems like the syringe is much bigger, fatter than ones I am accustomed to. Also the amount on the HCG bottle is much smaller than my previous bottles that looked 3/4 full. The new mixture looks like 1/4 that of my other bottle of mixture. I ordered online through Complete Pharmaceutics, LLC. It reads on the label, inject 17.5 on syringe. The syringes they sent are also different. I was taking 125 w/ smaller syringe. I am very confused by amounts. The syringe they sent me is 100 units. How much should I inject using the 100 unit syringe? Can you email the pic of the syringe at [email protected] so I can take a closer look and maybe help. Hi, thank-you for this amazing info. So much better than anything I’ve seen on the Internet. So I have what you call the wired syringe (the small insulin one in the picture above) so my question is my HGH bottle is 5mg – and my doctor says take up to 50 (on the syringe ) start at 30 and move up to 50. That sounds like so much. Can you help me with the dosing with the “weird” syringe please? You are so informative! Thanks!!!! Can someone in the group can answer this question to me, i want to start my hcg tomorrow and i need to know , use 150 i.u=15 units, 15 units have to be in the middle of 10 and 20 in my insulin syringe thats the amount i have to use of hcg i want to be sure. OMG girl!! You are so awesome! Congrats on the weight loss, you look great. You have gone above and beyond in answering any and all questions I have and more. Sending you to my friend. 🙂 BTW will let you know when I get started and stay in touch on my journey. I mixed my 5000iu hcg with 16.6cc of bacteriostatic water. I have got 100unit needles from your link. I’m trying to take 150iu a day where would that be on the needle. I’ve watched all your videos and I’m still confused is it 5ml? Thanks very appreciated. Please help..I am so confused. I did 10mL of water per 5000iu hcg. I am not sure if I need to talk 125ius or 250ius….does it depend on how much you weigh? I have a 50 unit syringe. Because of my 2:1 ration, where should I fill my needle to? Did you ever get a response to your question? I’m having the same issue. I was told to add 10 ml bac water the my 5,000 iu (Corion brand HCG) . Now I’m not sure. I was told to start with the 12.5 doses. Please, someone answer our question. Thanks! Yes if you mixed double the bac water, 10ml’s, in that case you have it right, you would double the spot on the syringe to get the dosage- so .25 or 25 units would now be 125ius (instead of the .125 or 12.5 units that’s usual if you had mixed with 5ml’s) – you have it right! 1000 iu per week/ up to 4 weeks is it enough? i am taking so cause i will be starting my steroid cycle. I am having a hard time with my needles. I have the needles that are 1ml. Should I be taking .2? Thank you for the help. I tried to e-mail and it was return to me. Hello Rayzel, Question #1 I ordered from Fast Escrow Refills with the weird syringes and I also ordered B12 ampules, My first round I ordered from Nu Image and the instructions were easy However I am not sure how much B12 to inject each day since it’s not mixed with the HCG. If you can please help me find the right dose of B12 in the 40 unit syringes that would be great, I was looking at other vlogs and someone said 40 units for females but that would be the whole syringe and that seems a bit much of B12 everyday. Question #2 should I inject B12 everyday or every other day or once a month. I don’t want to over dose on Vitamins lol. Thank you for the outstanding info. So I was feeling ravenous around 4 pm on 125 iu and my doctor’s response was to do an additional 125 injection at 4 pm. I’m on day 11 of the my first round. I just wanted to ask you if you’ve heard of this? Taking an additional dose in afternoon and basically doubling the amount? Does this sound normal to you? Do you inject just once in the morning? Thanks in advance for your input! I just received my vial of HCG. It is premixed. It is only a 1000 IU bottle and I have to do 150 units a day. Does this mean my bottle will only last about 6 days? Hi HCGChica. Amazing site by the way…my sister swears you are awesome, so thanks for your contributions and the enormous amount of work you put in here..you are an incredible motivation to many. I am starting my HCG tomorrow (it was supposed to be today but I screwed up and injected 5 instead of 12.5 or 17.5.) I have the exact setup as you stated above… 5,000 IU. The HCG is mixed as instructed and I am ready to go. 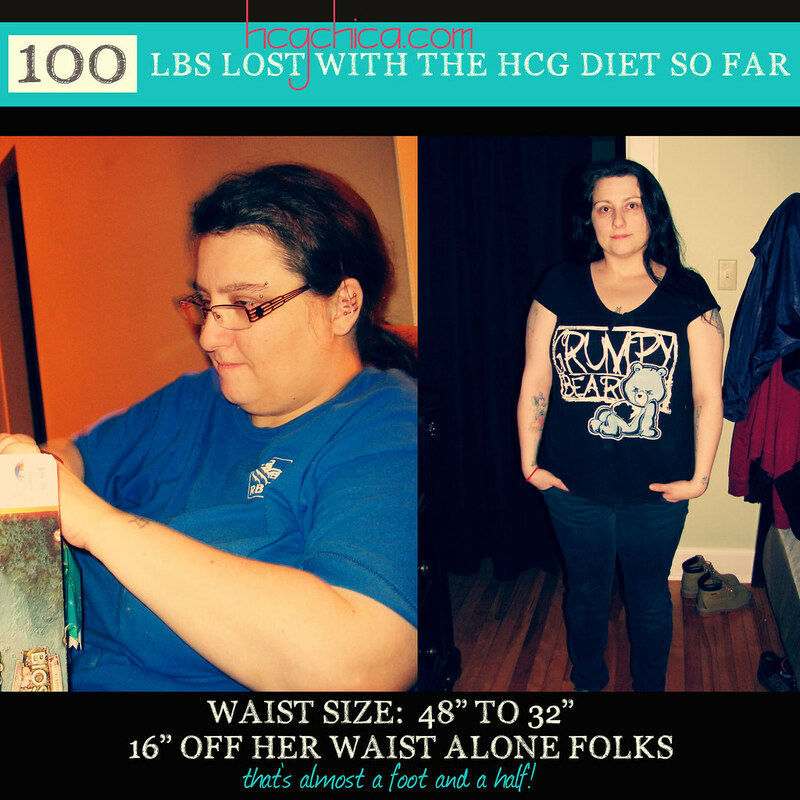 I’ve done HCG once before and it was at 12.5, I was hungry all the time (Male, 6′ 190 lbs). If I change my dosage to 17.5, will I have enough HCG to get me through phase 2? Also, for phase 1..loading days. I know you have to gorge..but do you have a handy gorge guide? I can eat 20 doughnuts an hour all day..but I want to really optimize this round. Hi HCGChica, Thanks for getting back to me. I followed the directions but for some reason I must have miscalculated. I used the measurements.. 5cc..-1cc in the hcg, mix and put into vial (totalling the 5cc). Since then, I have been injecting 17.5 each day. Its now day 5 and I have 19 days left for phase 2. HOWEVER, I need your help, the bottle seemed to go very rapidly and I was getting really concerned, I used an empty vial to see how much I have left and I only have enough for 6 more days of injections and I’ll be out. So I must have really screwed up something and I don’t want to stop and start over either. My original HCG came from EscrowRefills but they take forever to send it. I saw your other sources but they all sell the whole kit, I only need the HCG (I have everything else available). Do you know if anyone of them can help and overnight me the HCG so I can mix a new batch before mine runs out? By the way, would be happy to be interviewed on the blog :). My doc is starting me at 250, isn’t this a bit much for me? I’m 5foot 4 inches 160lbs 36 yr old woman. Thank you, and I appreciate your response. I think I’m going to lower it, and then see how i feel. Thank you! Hi @joana_moreno:disqus – as long as the needle you have is either a syringe where 100 units = 1 ml/cc, or 50 units = .5 ml/cc or 30 units = .3 ml/cc, then the .1= 10 units=100 iu’s of hCG, .2= 20 units=200 iu’s hCG In the mixing ratio you mentioned. If you want to post a picture you can. Our needles start with 10, 20,30 up to 100. In other words they go by 10’s and each hash mark between go by 2’s. Example: Between 10 and 20 there are 4 other marks. 10 12 14 16 18 20. Very difficult to see where 12.5 or 15 would be! My son will be doing it and from what I read men do better on 200 so at least he can use them easier then me! Just thought I’d let you know there are other types out there. Thanks for your blog. It’s been very helpful. We are not newbies to hcg but we were mixing 30ml to 5000 and doing 50 unit shots. Hey @jerireisdorfer:disqus Yes I had those syringes before too I think- I think you just get as close as you can, that’s all. Men do seem to do better on slightly higher dosages from my observation as well- between 175-200ius often times. Scared too death of injections! Any suggestions? Someone told me to ice the area so I don’t feel it. Hi there +MB – I know it SOUNDS scary- believe me I never intended to use injections myself- I too thought they sounds scary and painful and I had in my mind those big needles used for vaccinations when I was a kid. In actuality, the tiny is literally so short and thin that you actually feel nothing. I’m serious. I made my husband do my first injection because I was just that scared and I didn’t even realize when he had put it in because I literally felt nothing. The key is to inject into your fat. It’s really quite painless. I hope that helps. I was scared too! I did my first round at a clinic and they had me inject myself before leaving (with a B12 shot) so I could get the hang of it. You really don’t feel anything if you pick a good spot, you’ll find your favorites. My favorite spot to inject is on the sides of my abdomen, near the hip at the level of my navel. I pinch the fat, wipe with an alcohol swab then stick into the fat roll. If you go too near the navel it gets more ‘pinch-y’ in my experience. I alternate sides every day to avoid bruising. I agree. thank you for explaining! Very helpful after looking at 10 other websites trying to figure out what dosage this clinic is getting me.